Montana, these shared investments are managed through the state’s “general fund.” Taxes make up the vast majority (96 percent) of the revenue for the general fund. 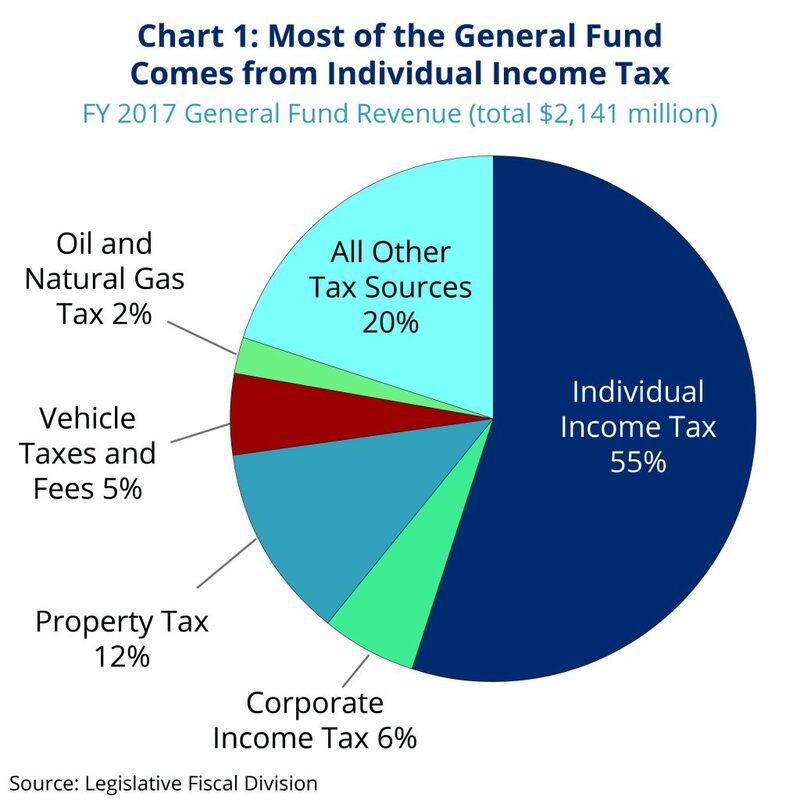 The individual income tax is the single largest source of revenue for the general fund, comprising just over half of the state’s tax revenue (Chart 1. ), In general, taxes paid by corporations are paid through the corporate income tax. However, depending on how the entity is structured, business income may actually be reported through the individual income tax. Specifically, if the business is structured as a C-corporation in order to receive the legal benefits associated with such a status (including limited liability for debts and business actions and access to capital markets), its taxes would be classified as corporate taxes. All other businesses, including sole proprietorships, partnerships, limited liability corporations, and S-corporations, report income on individual returns, and this amount is reflected in both pass-through income and business income, which comprises 22 percent of total individual income. Nationally, corporate taxes as a percent of the economy have declined over the last several decades. In the 1950s, corporate taxes as a percent of the national economy averaged nearly five percent. As of 2017, that rate has dropped to two percent. 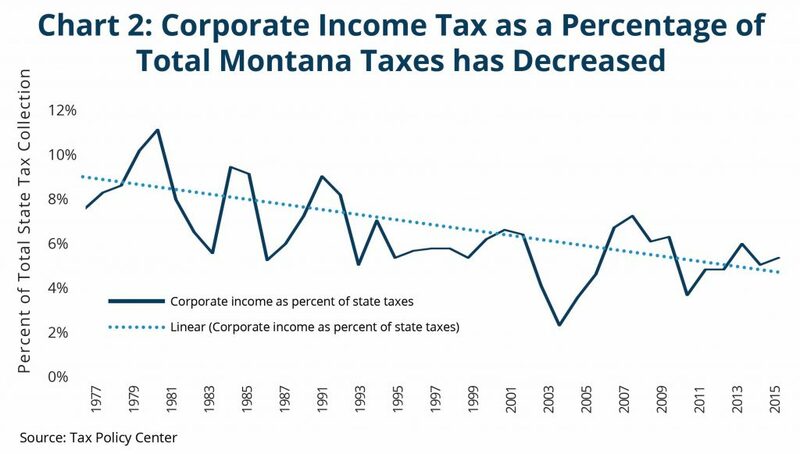 Likewise in Montana, corporate taxes have been declining since the late 1970s, making up a smaller and smaller portion of total state taxes (Chart 2). In 1981, corporate income tax made up 11 percent of total Montana taxes, whereas in 2015 that number declined to just under six percent. In 2014, Montana had over 16,000 C-corporations and only a third of them paid more than the $50 minimum corporate tax (Chart 3). According to Montana’s tax code, corporations pay either 6.75% of their net income earned in Montana or $50, whichever is greater. The phenomenon of corporations paying little to no state taxes has been well-documented nationally. A 2014 national study found that 90 profitable Fortune 500 companies paid no state income taxes in at least one year between 2008 and 2012. During the same period, 269 profitable, Fortune 500 companies paid an effective state corporate income tax rate that was less than half of the actual average tax rate in these states—costing state governments roughly $73 billion in lost revenue over those five years. Creative accounting utilized by corporations. The minimum corporate tax in Montana has been $50 since 1969. Had this tax kept up with inflation, today’s minimum amount would be $340. Updating the corporate minimum tax to account for past inflation and making sure it automatically adjusts for future inflation would modernize our tax system and slow the decline in corporate income taxes. Increasing the corporate minimum tax to $340 would raise at minimum $3 million in additional revenue per year. Combined reporting is an important policy tool that prevents corporations from utilizing a variety of tax avoidance strategies. Montana has been a leader in this area by using combined reporting for decades. A majority of states with corporate income taxes now utilize combined reporting. There are some limits to the water’s edge exclusion of international income. If a subsidiary is located in a country that is a known tax haven, the corporation may not exclude that subsidiary’s income even under the water’s edge election. In order for this exception to be useful and avoid inappropriate income shifting, the list of tax havens must be updated regularly in Montana law. The water’s edge election creates an uneven playing field for Montana-based businesses without an international presence, as it allows multinational businesses the opportunity to shift profits overseas without paying state corporate tax reflecting actual operations in the state. Tax haven abuse has grown exponentially over the past several decades, as more and more corporations have become international in scope and the industry of tax attorneys and accountants specializing in international tax planning has expanded. A 2015 report by Congressional Research Service estimates the overall loss of revenue to the United States as a result of offshore tax shelters at around $100 billion per year. The number of corporations that filed a water’s edge election in Montana increased 163 percent from 2007 to 2014. A proposal to eliminate the water’s edge election has been proposed but has not passed in the past several legislative sessions, most recently in the 2017 session, which would raise approximately $8 million in additional revenue. The Department of Revenue creates a report of tax expenditures each biennium. However, there is no requirement that tax expenditures are reviewed regularly by the Legislature. Corporate tax expenditures cost Montana between $10 and $15 million per year. 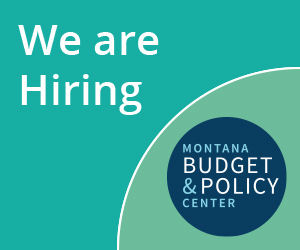 For more information about tax expenditures see Montana Budget and Policy Center’s 2011 report, Flying Under the Radar: Time to Evaluate Tax Expenditures. Requiring the review or sunset of tax expenditures. Montana Legislative Fiscal Division. “Report to Revenue and Transportation Interim Committee Members.” Fiscal Year 2017. June 4, 2018. https://leg.mt.gov/content/Publications/fiscal/Revenue/Rev-Updates/FY2018.pdf. Montana Department of Revenue. "Biennial Report: July 1, 2014- June 30, 2016." December 2016. https://mtrevenue.gov/wp-content/uploads/2017/07/2016-Biennial-Report-Complete.pdf. See also Legislative Fiscal Division. “2021 Outlook for the General Fund Budget.” June 18, 2018. https://leg.mt.gov/content/Publications/fiscal/interim/June-2018/2021Outlook_Final.pdf. Montana Department of Revenue. "Biennial Report: July 1, 2014- June 30, 2016." December 2016. https://mtrevenue.gov/wp-content/uploads/2017/07/2016-Biennial-Report-Complete.pdf. Office of Budget and Management. “Historical Tables: “Receipts by source as Percentage of GDP: 1934-2023.” Accessed September 28, 2018. https://www.whitehouse.gov/omb/historical-tables/. Urban Institute. “State and Local Finance Initiative Data Query System.” Accessed September 26, 2018. https://slfdqs.taxpolicycenter.org/pages.cfm. Montana Department of Revenue. "Biennial Report: July 1, 2014- June 30, 2016." December 2016. https://mtrevenue.gov/wp-content/uploads/2017/07/2016-Biennial-Report-Complete.pdf. Because of privacy restrictions, data is not available on which corporations paid the minimum of $50. Robert S. McIntyre, Matthew Gardner, and Richard Phillips. “90 Reasons We Need State Corporate Tax Reform.” Citizens for Tax Justice and the Institute on Taxation and Economic Policy. March 2014. https://www.ocpp.org/media/uploads/pdf/2014/90ReasonsFull.pdf. Robert S. McIntyre, Matthew Gardner, and Richard Phillips. 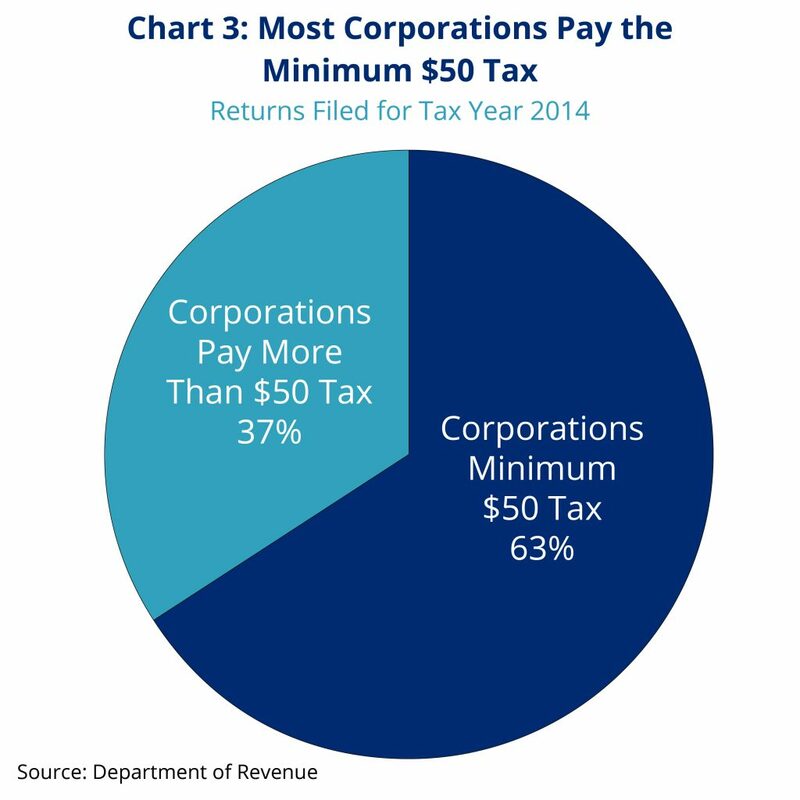 “90 Reasons We Need State Corporate Tax Reform,” Citizens for Tax Justice and the Institute on Taxation and Economic Policy, March 2014. https://www.ocpp.org/media/uploads/pdf/2014/90ReasonsFull.pdf. U.S. Bureau of Labor Statistics. “CPI Inflation Calculator.” September 26, 2018. https://www.bls.gov/data/inflation_calculator.htm. This is a conservative estimate of the amount of revenue an increase in the minimum corporate tax would generate, as it is calculated using the number of corporations currently paying the minimum $50 tax. It does not include corporations currently paying between $51-$340 who would also be affected by the increase. MBPC calculation using Montana Department of Revenue. "Biennial Report: July 1, 2014- June 30, 2016." December 2016. https://mtrevenue.gov/wp-content/uploads/2017/07/2016-Biennial-Report-Complete.pdf. Michael Mazerov. "A Majority of States Have Now Adopted a Key Corporate Tax Reform — “Combined Reporting.” Center on Budget and Policy Priorities. April 3, 2009. https://www.cbpp.org/research/a-majority-of-states-have-now-adopted-a-key-corporate-tax-reform-combined-reporting. J. Gravelle. “Tax Havens: International Tax Avoidance and Evasion.” Congressional Research Service. January 15, 2015. https://fas.org/sgp/crs/misc/R40623.pdf. Montana Department of Revenue. "Biennial Report: July 1, 2014- June 30, 2016." December 2016. https://mtrevenue.gov/wp-content/uploads/2017/07/2016-Biennial-Report-Complete.pdf. Montana Department of Revenue. "Biennial Report: July 1, 2012- June 30, 2014." December 2014. https://mtrevenue.gov/wp-content/uploads/2017/07/2014-Biennial-Report-Tax-Expenditures.pdf. Governor’s Office of Budget and Program Planning. “Fiscal Note 2019 Biennium: SB 105.” January 19, 2017. https://leg.mt.gov/content/Publications/fiscal/interim/June-2018/2021Outlook_Final.pdf. Michael Mazerov. "Minority of States Still Granting Net Operating Loss “Carryback” Deductions Should Eliminate Them Now." Center on Budget and Policy Priorities. May 11, 2009. https://www.cbpp.org/research/minority-of-states-still-granting-net-operating-loss-carryback-deductions-should-eliminate?fa_view=&id=2760. The water’s edge election expenditure amount is an estimate from $8-13 million. Montana Department of Revenue. "Biennial Report: July 1, 2014- June 30, 2016." December 2016. https://mtrevenue.gov/wp-content/uploads/2017/07/2016-Biennial-Report-Complete.pdf.